On behalf of the Water Research Foundation, THG in collaboration with PLDO conducted an assessment of public-private partnership (P3) opportunities for water and water resource recovery utility (W&WRRU) energy projects. 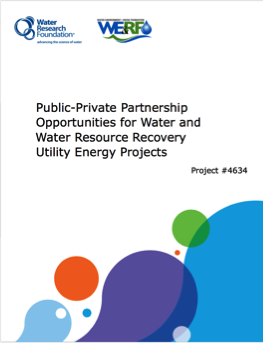 The final report, Public-Private Partnership Opportunities for Water and Water Resource Recovery Utility Energy Projects, will assist W&WRRUs identify opportunities and undertake energy projects through P3s. The Water Environment & Reuse Foundation was a partner on this project. The report includes a detailed review and discussion of relevant energy projects and P3 issues, including energy and P3 project drivers, legal matters, risk allocation, financing options, contractual drafting and structuring, and monitoring and oversight. Collaborating with a geographically diverse set of utilities, the report contains case studies providing concrete examples and lessons learned for P3 energy projects at W&WRRUs. The report concludes with a set of recommended best practices for undertaking such projects.